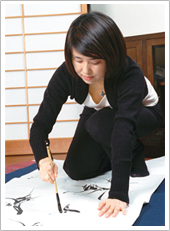 Shodo or Japanese Calligraphy is a traditional Japanese culture. Through Kanji or Japanese words I would like to make my ideas come across vividly to the visitors and draw meaning from the artistic form. My shodo style arouses your imagination visually and can be found fascinating even if you don’t understand the meaning of Kanji. I would be more than grateful if you could feel Japanese culture from my new style of expressing Kanji which is associated with modern and contemporary life style. 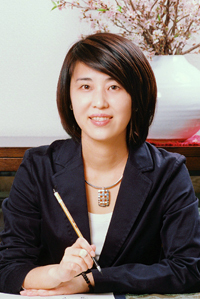 From 1998, I started to learn the basic skills of calligraphy and to create original work under the great Master Koyo Taniguchi. Later, I finally obtained a master qualification and received the name Sen'yo which means madder leaf after Master Koyo Taniguchi. Since then, I have been learning Chinese classical calligraphy under the great Master Zhou Zhi Jiang. Currently, I am dealing with a wider range of activities such as producing my own work, creating shop's logos and merchandise logos. I have been working vigorously to hold my own private exhibitions and submitting my work to several exhibitions. I have also been selected and won several prizes in various competitions and exhibitions. If you have any queries, please click here. Copyright © 2019 Senyo Maruyama. All Rights Reserved.